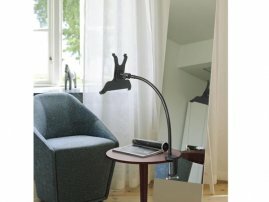 Flexible / Gooseneck Table / Deck Mount For iPad Air, Mini / Galaxy Tabs, Notes / Kindle Tablets [AP002762] - $27.95 : allputer.com - Accessories for all your Portable Electronics & Computers! This mount allows you to mount to a flat edge thickness of 10~50mm. It allows you to keep your iPad always at sight and a place that you will never get blocked. It allows you to adjust your iPad in any angle, say tile or any directions and accepting a devices. - Keep you iPad / Tablet at sight! - Keep your desk neat and tidy. - Very well made to permit you to bend it however you like.